New Yorker Rochester, New York — January 2, 1869 THE MORMONS: Pen and Pencil Sketches Illustrating their Early History. “…young Rigdon was brought up to hard farm work, with extremely limited advantages of education. He became acquainted with a Baptist minister and his attention was called to personal religion. He received baptism not far from the time in which he attained his majority. He now struck out boldly from the homestead and spent a number of months in the family of his new friend and spiritual counsellor, the Baptist minister before mentioned. Here he found what seemed to him a perfect paradise of books and intellectual companionship. He found in himself an insatiable thirst for reading. He read history, divinity, and general literature, without much method or aim, except to gratify his intense love of reading. He gave great attention to the Bible, and made himself very familiar with all parts of it. 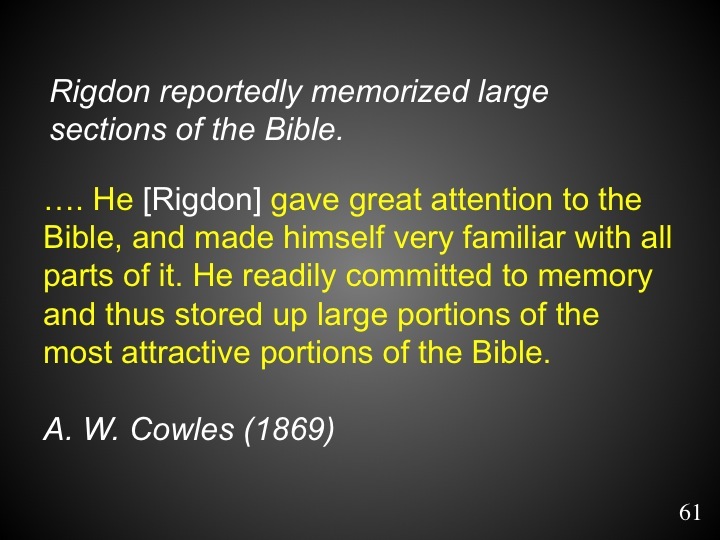 He readily committed to memory and thus stored up large portions of the most attractive portions of the Bible.” [Italics added].